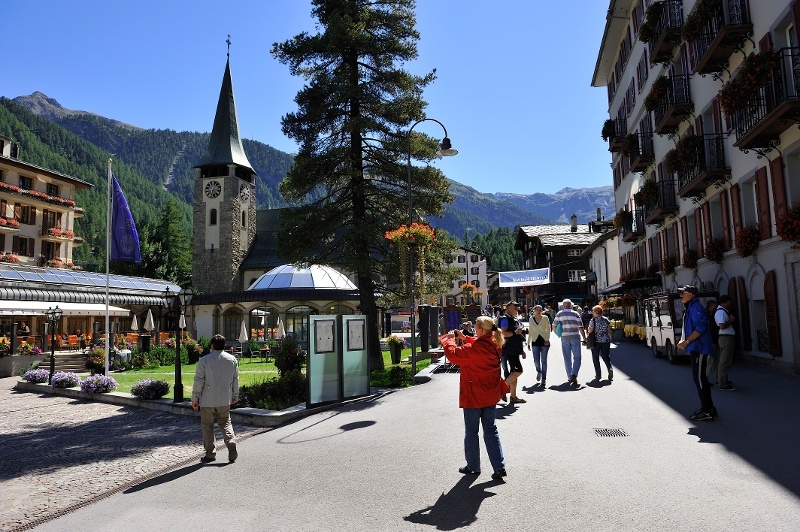 The village of Zermatt has been shaped by ancient traditions and modern tourism. The thrilling contrasts can be explored on a walk through the village. Time required: from 1 hour to half a day. In the old village, beside the Grand Hotel Zermatterhof, about 30 ancient buildings show the traditional building style of the original Walser residents. The barns and grain stores, up to 500 years old, are a piece of living history and reveal how the mountain farmers of Zermatt once lived. The old village is located on square E8 of the plan of the resort. 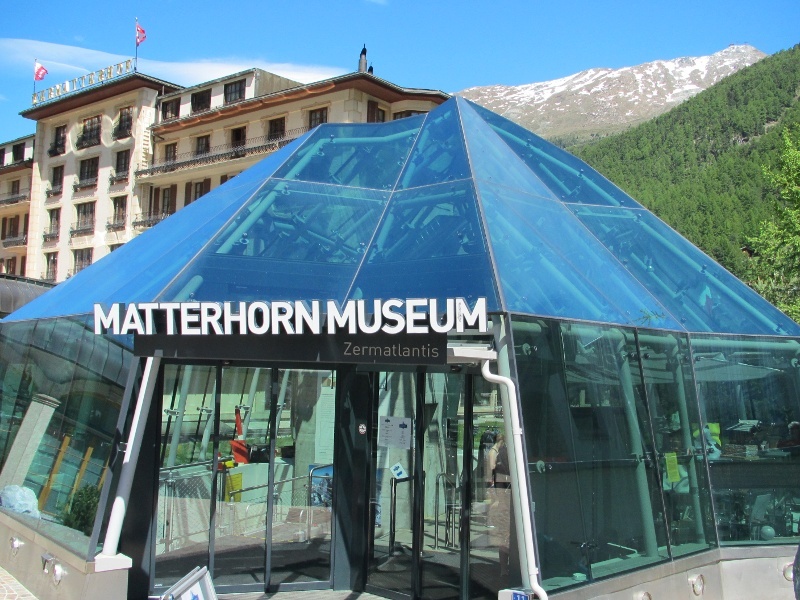 Anyone interested in the lifestyle of local people in days gone by should visit Zermatlantis, the Matterhorn Museum. 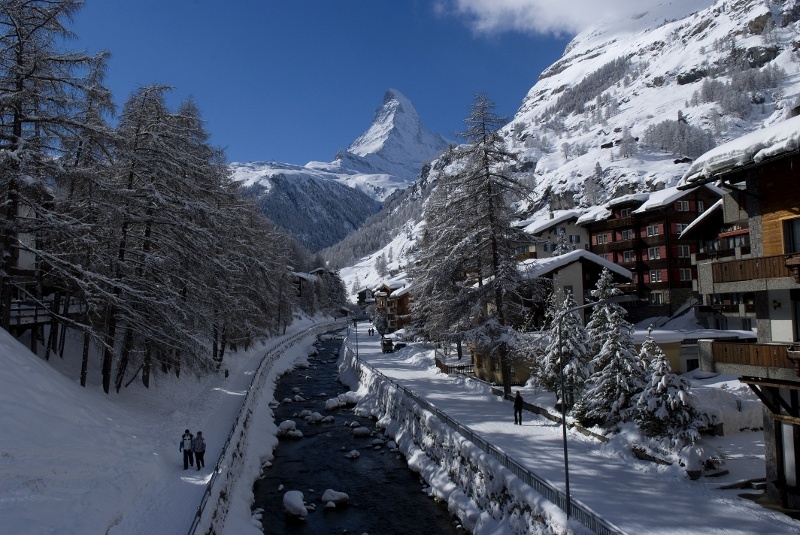 Zermatt is also home to more than 100 hotels and numerous chalets, some ancient, others very modern. The resort does not, however, have any giant hotel blocks or flat roofs. 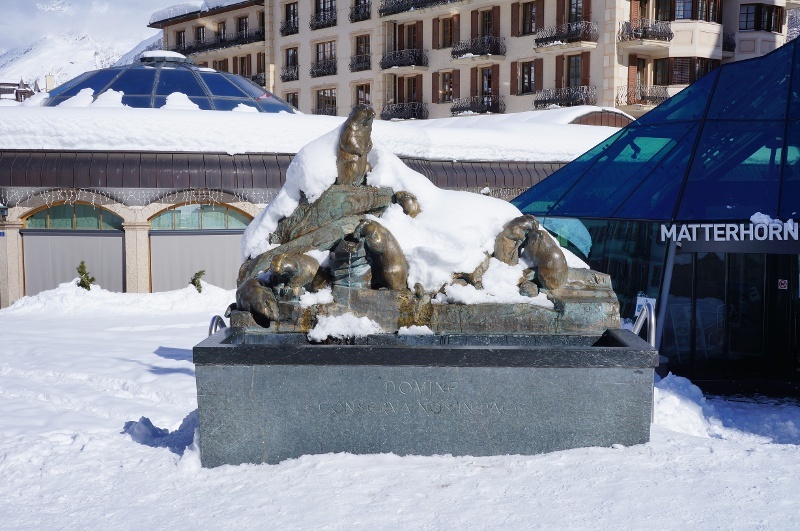 Three hotels are particularly worth noting: the Monte Rosa (the first hotel in Zermatt), the Grand Hotel Zermatterhof and the Mont Cervin Palace. All three hotels have bars open to non-residents where visitors can experience all the hospitality and charm that characterise Zermatt’s hotel tradition. Squares E/F and 8/9 on the resort plan. The Bahnhofstrasse is Zermatt’s main street, and a delight to walk along at any time with its bars, restaurants, boutiques, souvenir shops, bakeries and shops selling cakes and chocolates. From the steps of the church of St. Mauritius or from the Kirchbrücke bridge, visitors enjoy a fine view to the south-west of the Matterhorn rising majestically into the sky. Depending on weather, the peak may be sparkling in the sunshine or adorned with clouds. Since 1961, Zermatt has been closed to traffic. The Bahnhofstrasse is the domain of horse-drawn carriages; strolling along the streets is a pleasure. In high summer, a herd of about 50 Valais Blackneck goats descends on the Bahnhofstrasse every day at about 9am and 5pm. With their twisted horns and long-haired, black-and-white coats, these photogenic animals are the secret stars of the Matterhorn village. Anyone who rises early to see the sunrise on the Matterhorn is treated to a magical sight. The pinnacle catches the very first rays from the sun, which gradually work their way down the east face of the Matterhorn as Zermatt awakens to a new day. Insider tip no. 1: Stop for a coffee or a drink at Edward’s Bar in the Hotel Monte Rosa. 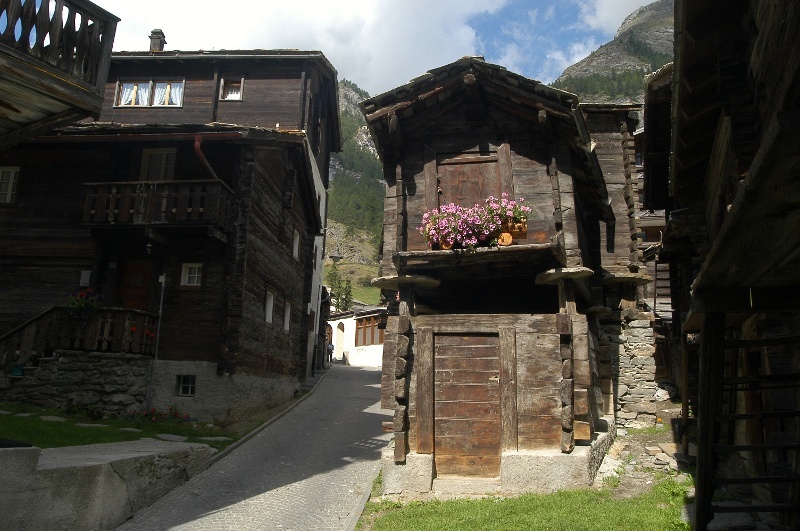 The beams and walls of Zermatt’s first guest accommodation from 1839 can be seen. Insider tip no. 2: Order a coffee or a glass of wine in the Ruden Bar of the Grand Hotel Zermatterhof. The coats of arms of Zermatt’s old families are on display. Free insider’s tip no. 1: Sip some water from the memorial fountain to Ulrich Inderbinen (E8 on the plan). The ice-cold, top-quality spring water bursts with mountain freshness. Ulrich Inderbinen (1900-2004) was the world’s most famous mountain guide. He continued to lead visitors up the Matterhorn until the age of 90; in all, he scaled the "Hore", as locals call the Matterhorn, more than 370 times. Free insider’s tip no. 2: Go for a stroll through the Scheibenwald forest (Scheibenwaldweg, D12 & E12 on the plan). 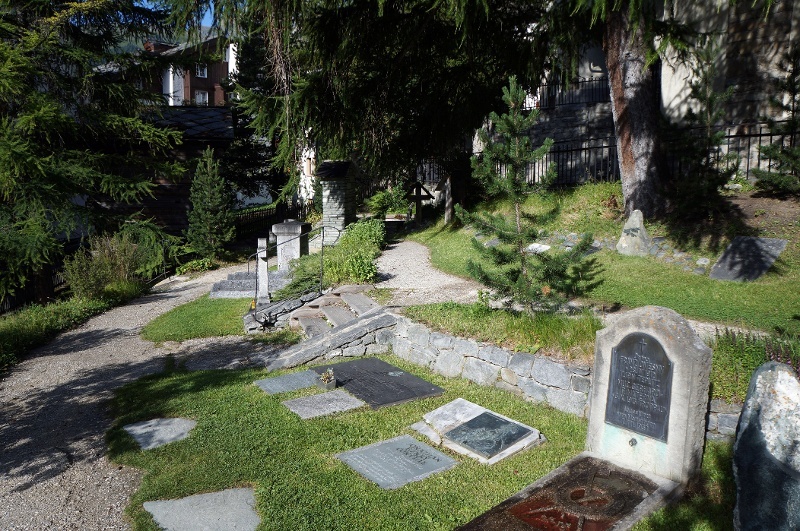 This peaceful path has numerous small wayside chapels depicting the Stations of the Cross as well as a small Lourdes grotto. From the Schluhmattstrasse, a steep flight of steps leads to a small area of cliffs and forest, a haven of tranquillity. These heights are home to centuries-old barns, built on stilts and balanced on flat stone slabs (to keep out rodents), as well as modern houses. The path ends at the "Winkelmatten" stop for electric buses, by the Winkelmatten chapel. Here, several wooden benches offer views of the Matterhorn. Free insider’s tip no. 3: Visit the Freundschaftsgarten (“Garden of Friendship”, small park with pond, E9), a tranquil spot for reading or contemplation.